Album Title: Do You Like Rock Music? 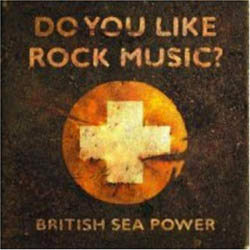 Or more appropriately, do you like grandly ambitious Rock music? A gutsy, atmospheric disc of rumbling panoramas, caressing epics and invigorating inquires, “Do You Like Rock Music?” balances awe with irony for a sublime combination of youthful triumph and revolutionary transcendence. Distilling a turbulent world view into tenacious fables of personal politics, BSP’s edgy eloquence preaches over bristling riffs, bashing guitars, expansive arrangements and vacillating dynamics. Churning and melodramatic, BSP’s smart mouths, nimble fingers and savvy minds suggests early Radiohead folded around desperately earnest Bowie and socially conscious Pulp. Deliberately forthright and emphatic, BSP’s conniving conundrums of post-modern perspectives makes, “Do You,” a masterful exercise in pushing boundaries while staying the course, making waves guided by the stars. BSP plays Chicago’s Empty Bottle March 24.